If you’re packing for a family, packing cubes of different colors is an easy way to both pack and unpack without mixing up belongings. Opening your suitcase in the hotel to find that your belongings have become jumbled and dirty is no way to start off a trip. Packing cubes are an inexpensive way to ensure that your belongings remain folded and organized as you intended. If packing for a trip is something you dread, this can be an easy way to simplify things and make order of the chaos. Packing cubes are often made of waterproof materials and have soft shells to easily fit your belongings compactly in your suitcase. Mesh windows allow you to easily identify the contents of each bag. Packing cubes come in a range of styles, sizes, quantities, and materials to meet your travel needs. Most sets include different size cubes so that you can appropriately sort your clothes and toiletries, with larger cubes fitting bigger clothing items and smaller cubes holding things like undergarments. The number of cubes is an important factor that is dependent on your needs and available space. Most sets include between three and eight cubes of varying sizes. The size of packing cubes is an important consideration, as you don't want to get a set that doesn't fit in your luggage. If you need a convenient way to separate laundry during your trip, look into sets with an laundry bag. The fabric of the cubes is important as well, as it determines the durability and weight of your cubes. Vinyl cubes are see-through, making them a good choice for quickly accessing your belongings, but they tend to be less durable. Nylon and polyester cubes are more robust than vinyl packing cubes and will do a better job of protecting your belongings, though they are usually more expensive. Packing cubes are usually fairly similar in design, but there are some differences. Some packing cubes may include pockets for storing smaller items. Designs that are easy to crush down to a small size are ideal if you plan to bring extra cubes to pack souvenirs or other items acquired during your journey. Once you're at your destination, you can use your packing cubes to separate clean and soiled clothing. If you're sharing a bag, the cubes can also be used to separate belongings by owner. For under $20, you can get a three- or four-piece set that may be lacking in construction and zipper quality. The majority of sets fall between $20 and $50 and typically have three to six pieces, with price corresponding to material quality. Sets for above $50 offer a generous number of cubes with durable-yet-compressible materials. Look for packing cubes with durable zippers, as a broken zipper can render your packing cubes useless. If you know your bags don't have many small pockets, look for packing cubes of smaller sizes or with built-in pockets. Q. How do packing cubes compare to travel compression bags? A. While packing cubes don't save quite as much space as compression bags, they're less likely to wrinkle your clothes and allow you to easily access your belongings while you travel. Q. What determines the durability of packing cubes? A. The primary material is the biggest factor, but parts of the cube like pockets and mesh that could snag can also shorten the lifespan of your packing cubes. 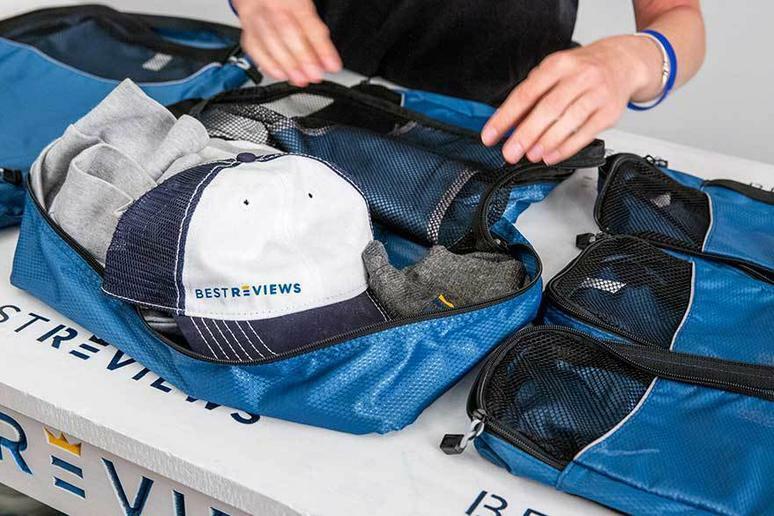 Our take: With their lightweight materials and manufacturer's lifetime guarantee, these are the best packing cubes available. What we like: The durable construction of these nylon cubes with mesh tops makes them a reliable option that will protect your belongings. The range of included sizes make it easy to pack a variety of items. What we dislike: These cubes come with a higher price tag, but it's well worth it. Our take: This set of cubes offers a low-priced option that doesn't sacrifice quality. What we like: Though there are only four pieces in this set, they offer more than enough room, and the water-resistant nylon is lightweight and durable. Six vibrant colors are available, and the zippers are impressively tough. What we dislike: It's difficult to see contents through the mesh, but this is a minor drawback. Our take: If you're looking for a six-piece set, this option is cheaper than many competitors and has decent construction. What we like: This set stands out for its large mesh windows that allow you to easily see contents, and with six pieces, it's easy to securely pack your belongings. What we dislike: The material of these cubes is not as waterproof as other common fabrics.